Paint your boxes your desired color using craft paint. Let dry. Line up your box on your paper, and trace along the bottoms of the boxes. You cut 1/4 inch (depending on the width of the sides) down from the traced size. Make sure the paper fits well inside the box. Modge Podge the bottom of your boxes with a paint brush and immediately press and smooth your paper along the bottom. Let dry. love it. probably will use this tutorial some day soon actually! ooh! i definitely need one of these. I love this project. I did the same thing but with some little wooden boxes and loved the result, but I like the idea of this project even better! lovely designs! 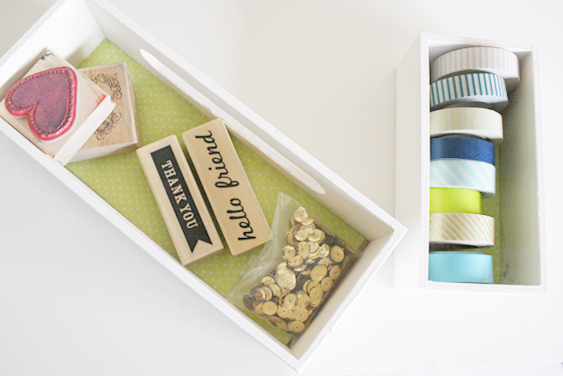 the colors are perfect :) I could totally use those to organize my desk! 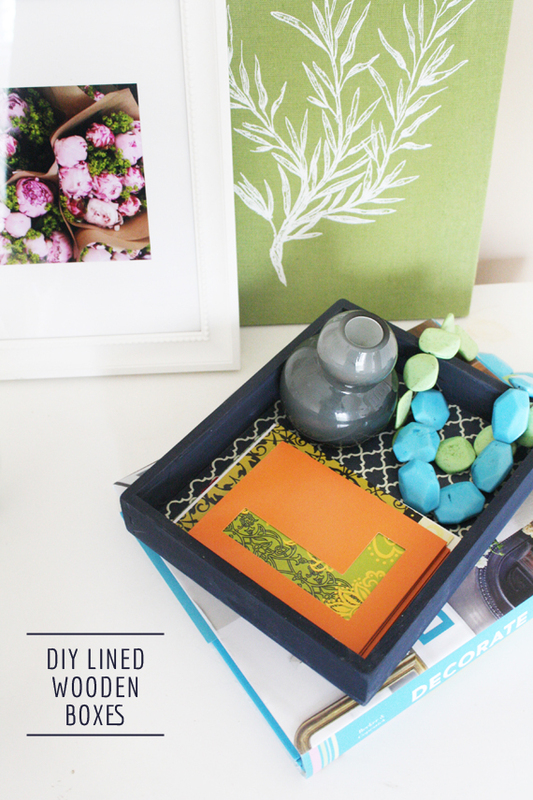 I need to find some wooden boxes and make a few of these asap! Thanks for the inspiration. PS - Hope to see you tomorrow night?! Looking forward to meeting you! Very cool! I was thinking of buying some wooden art blocks they have in the stretched canvas section, turning them over and using them for my jewelry, maybe stacking them. I didn't think about patterns in the bottom! I want to try that now that I've seen how cute yours turned out. I love this! I need one of those for my dresser. Oh great idea! So simple, but it looks so stylish. I love using trays to really make a space look pulled together. yes, this is perfect. I'm always in need of something to coral the little things. What a cute idea! I'm definitely going to make these. 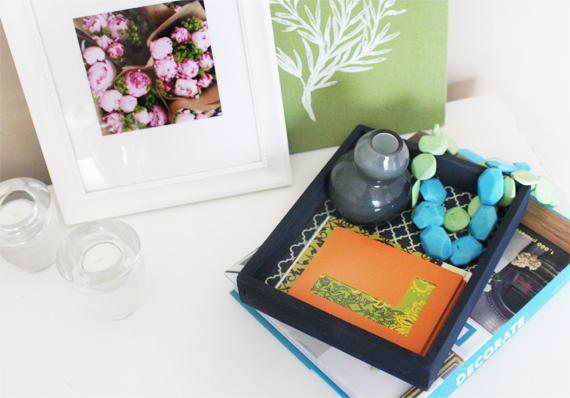 Add some cute glass jars to hold crafting accessories, or desk essentials. Love it! Great idea! Going to this so I can store all the stamps I had purchased for my wedding. Thanks for sharing! Oh my gosh Anna. This is a great idea. Hmmmm...making a trip to Michaels. May have to pick up some supplies! totally hitting my craft store and making some of these. they are super cute! AND useful! Such a good idea!! Love it! Hello! New follower right here! I found you over at Fairy Tails are true! LOVE your blog..great post I am in the beginning stages of redoing my bedroom and this looks like a fun project to include! What a great idea! Now to find where I stashed that Melissa and Doug tray! Brilliant! And such a fun pop of color! I think I need to try this one too. Oooh, I think this just might be a MIL mother's day gift! Thanks so much for sharing your creative mind and talent!!!! i'm featuring you on my blog tomorrow-check it out! Such an easy and rewarding DIY. I need some of these in my house! I really want to do this! I think it could work for the cubical as well to add some spice and color. These look great! So cute, and would make great gift basket "holders" with goodies for gifts!